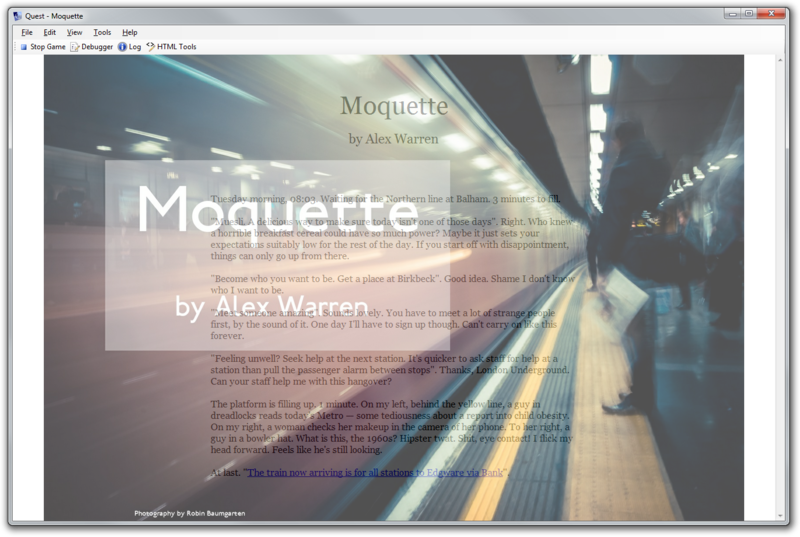 Following on from the previous blog post (Moquette Post-Mortem and Review Roundup), here’s a look at how some of it was implemented. 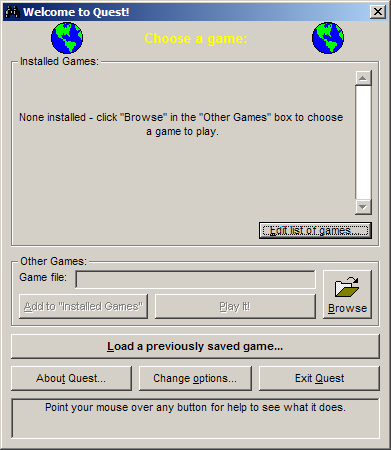 Moquette was entered into the IFComp not under the Quest category, but as a web-based game only. Why? Because I used my latest development version – Quest 5.5, which is currently available only as an unsupported pre-beta “nightly” build. 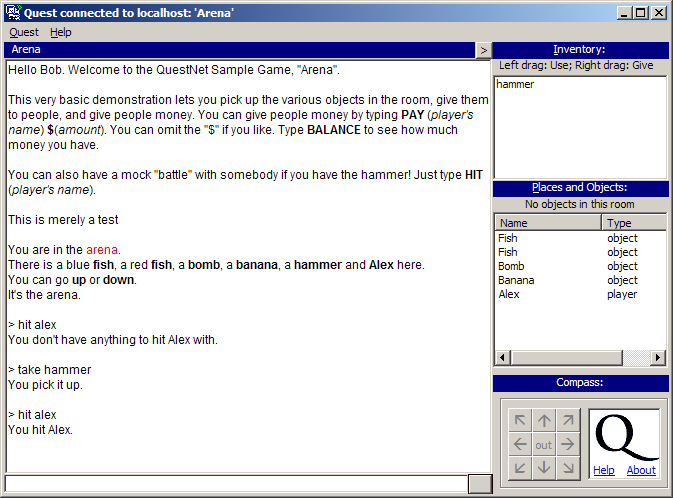 A downloadable .quest file was submitted to the IFComp for archive purposes, and will be made available from the Moquette page on textadventures.co.uk when a beta version of Quest 5.5 is ready – which should be in the next month or two. The changes in v5.5 as far as they apply to Moquette are cosmetic – I needed the ability to completely hide the location bar and game border, and to set a custom screen width. I also needed the ability to disable a command link after it’s clicked, and I implemented some changes to how scrolling works so there is a nice smooth transition when new game text is added. Moquette is full of contradictions. It’s a game, but it’s not a game. It has many choices, yet no choices. And on a technical level, it has many locations (a full tube map) and yet it really only has two locations – the train and the platform. Everything else is just labelling of scenery. Get off one train, change to another line, get on a different train – as far is Quest is concerned, you’re just right back where you started. The train has attributes to represent the line it’s travelling on and the station it’s at (or, if it’s in a tunnel, the station it was most recently at). It also counts turns – there is an overall turn counter, used to trigger plot events, and there is a rolling counter – every three turns, it triggers the next station on the line. The platform has attributes to represent the lines that stop there, the direction trains go in for each line, and its location (station). At many stations, there is one platform in each direction for each line – but that’s not true for e.g. the Circle and District lines which share platforms. I started in the top-left of the tube map, at Paddington, giving the station an index of 100 for each line that stops there. Then I went along each line counting up or down. So, Bank ends up at index 110 on the Central line, 105 on the Bank branch of the Northern line, and 101 on the Waterloo & City line. So, the code for moving around the tube network is pretty straightforward. But it wouldn’t be a journey on the London Underground with people. Lots and lots of people. Too many people. Well, there are only 36 passengers in total in Moquette. Even if they were all on one tube carriage, you would still just about find a seat. They are randomly assigned to each train when you get on. If you interact with them, that is recorded so that they won’t appear again. Every time the train enters a station, some of the passengers might get off and some new ones may get on – if you didn’t interact with them the first time, they may reappear later. This is why they tend to have fairly generic names such as “a man” or “a middle-aged woman”. I wanted you to get the impression that there were many more passengers than you were given the chance to properly look at. In addition to the train and platform, there are locations for each of the plot events – the introductory part of the game is implemented as a sequence of rooms, as are the “visions” (the two smoking visions and the clay), the interaction with Heather and the interaction with Private Rod. The introScreen function hides Quest’s game output (which is entirely in the gameBorder div), then adds a new hidden div called introScreen containing the intro image. Once this has loaded, the function inside the call to jQuery’s .load() method is run – this ensures the image has always fully loaded before we show it. This fades the introScreen div into view over 4 seconds, and 7.5 seconds later calls finishIntroScreen to fade it out again. 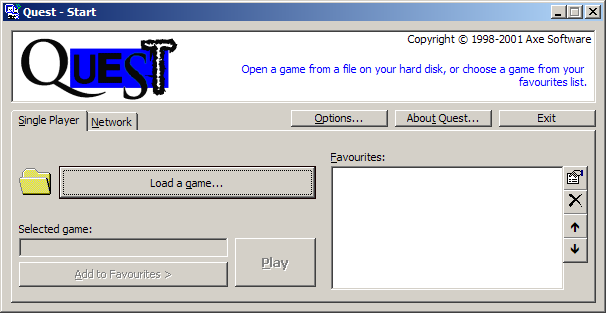 finishIntroScreen first re-shows the gameBorder div containing the Quest output (which by now will contain the introductory game text), and then it fades out introScreen – to reveal the game text underneath. The next effects occur in the first few turns – after Zoran gets on the first train, the text is nicely scrolled up and out of the screen, leaving it blank. The next effect occurs after the player makes the choice for Zoran to do something different than take his usual train today (or if Zoran makes that choice himself) – it’s the same effect again really, but this time the screen text is whisked off to the left. This calls the “drop” effect on divOutput, which contains the game output text (we could have used its parent, gameBorder, again I suppose as we’re not displaying an actual border around it). After this has run, the screen is empty, which means we can empty divOutput by hiding all the output sections on it (looking at this now with fresh eyes, that might be some old code as we clear the screen in a moment anyway). which gets us our Quest output back so we can start writing to it again. 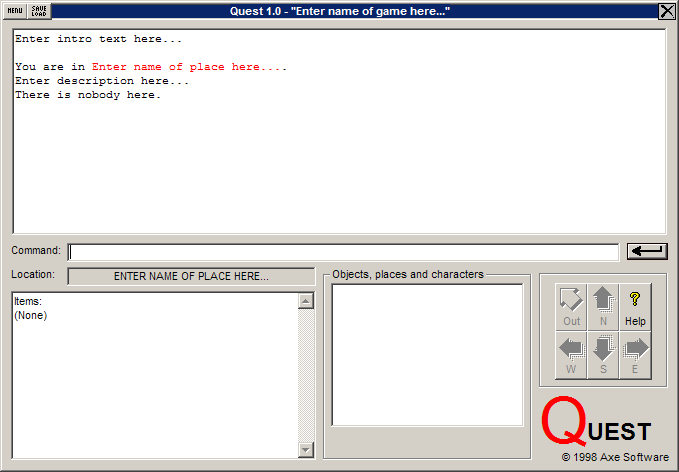 We start a new output section and move the player to the next location. This places a new div over the game output, then calls a function at regular intervals to write the word “Heather” at a random location, size, greyness and opacity. 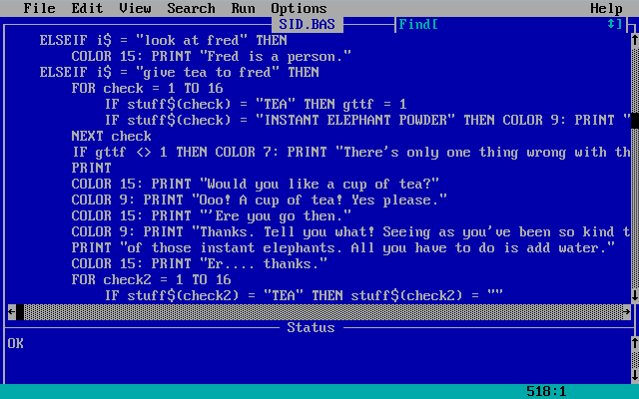 After doing that a certain number of times, it triggers the ASL function JSFinish_HeatherText, which moves the player to the next location to start the conversation. 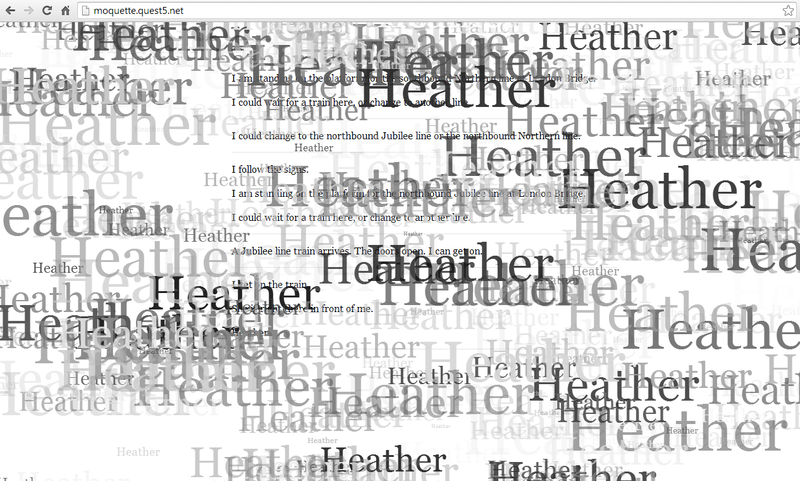 Then it fades out the “Heather” div and removes it. After meeting Heather, the “speckly” blackout works similarly – there are really two effects happening at once here. The blackout itself is simply a full-screen black div that fades in, fades out, then triggers the next part of the game. The speckles effect runs at the same time, and is similar to the previous “Heather” effect except with random letters – and they increase in size as the animation runs. The final two animations are designed to evoke the feeling of sitting on a tube train while it enters and leaves a station. On the Underground, station names often appear on platforms above people’s heads, spaced quite close together. When you’re sat on a train looking out of the window as it pulls into a station, this gives something similar to the classic HTML “marquee” effect, but with the text scrolling past too rapidly to read at first, then slowing down and eventually coming to a stop. 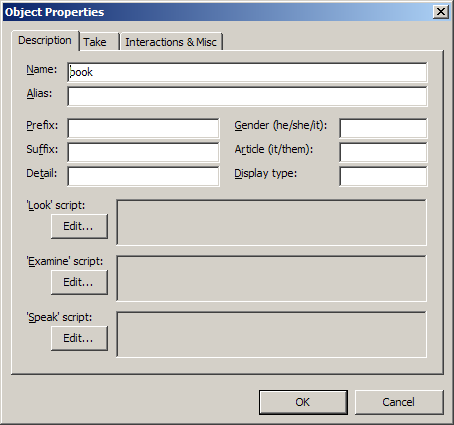 This temporarily sets overflow-x to “hidden”, which means we can have HTML elements off to either side of the screen without showing a horizontal scrollbar. Now all we need to do is animate a div containing the text “HEATHER” from off-screen on the right, to off-screen on the left. We do this with a duration that starts at 200ms and exponentially increases, to give the feeling of deceleration. 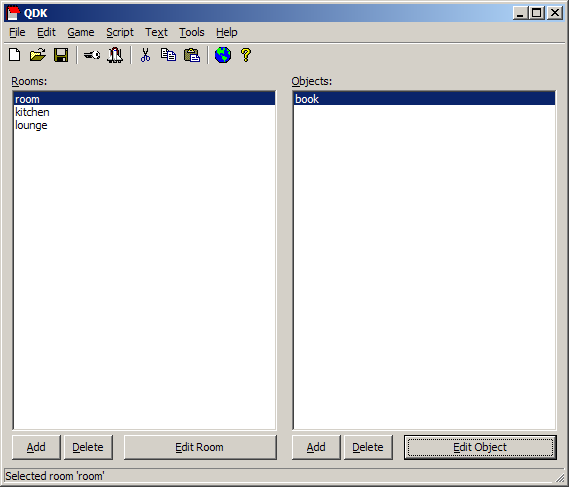 The final animation does the same thing, but with the whole of divOutput – so the entire game text. We do it the other way around, starting from a long duration and decreasing it each time (by dividing it by 1.3). Once duration reaches a value less than 500ms, we keep it constant and slowly fade out divOutput. I’m not sure it would make too much sense for these kinds of effects to be more “built-in” to Quest – they would quickly become annoying through overuse. But if you need any advice on how to achieve a particular effect, post a message on the forums and I’ll be happy to advise – I can also do this kind of thing for you as part of the customisation service. This entry was posted in Quest on November 26, 2013 by textadventurescouk. This is a guest blog post by Tara Fickle. So why did I end up creating Inside the Japanese Internment anyway? Well, because the real point I wanted to make is that it’s not about being forced to bring together game and history; when it comes to the internment, and, indeed, to Asian Americans as a whole, the fact is that you can’t separate the two. In the national imagination, Asians have always been stereotypically cast as game players; they scheme, they dissemble, they present their inscrutable poker faces to the world, faces whose intentions cannot be read, whose emotions cannot be detected. And after Pearl Harbor, that was precisely how supporters of the internment justified the relocation program: as a national strategy, a way of separating the loyals from the disloyals, the truth from the bluff. (This is an argument that I flesh out in detail in the first chapter of my dissertation, which you can read here). The internment was already a game – of the most serious sort. Inside is meant to make you realize that. That’s why I don’t think of Inside as just an educational game – what Tom Cole aptly dubbed “a game with an educational skin” – but more like an interactive museum. It’s based almost exclusively in historical fact; I’ve changed most of the names, but the vast majority of the situations that players encounter – from cosmetic surgery to the Rescue of the Lost Battalion to the Tule Lake Uprising – are documented in historical accounts and court cases. Much of the game’s content is also adapted from novels written by internees like John Okada and Hiroshi Nakamura; in those cases, it’s not about whether the events really happened or not, but about understanding what and why those authors would choose to fictionalize – and about exposing their novel literary styles to the larger audience that they so greatly deserve. And that’s really what I hope that Inside will accomplish in the broader sense: that it will expose individuals to different, radically new ways of thinking about the internment and about Asian American literature; about how history gets written, who writes it, and how technology has the potential to change it. In the immediate future, I’d love to expand the game and get it installed as part of the permanent exhibit on internment at the Japanese American National Museum, a Los Angeles-based institution which has George Takei on its board of trustees. I also hope that educators, at both the high school and undergraduate level, will consider adopting it as part of their units on World War 2. But Quest gives students a voice, a sense of agency that they often feel they lack when faced with a mass of words on a page. What if, instead of asking students to write a paper on the theme of fate in Romeo & Juliet, we first asked them to choose a scene and recreate it as a short gamebook using Quest? Suddenly, they’re able to use their imaginations, their writing and critical thinking skills, their artistic sensibilities, to create something. Now they’ll have to ponder the same “what ifs” that Shakespeare himself contemplated when writing the play; what if Romeo hadn’t taken the poison? What if Juliet hadn’t confided in her nurse? 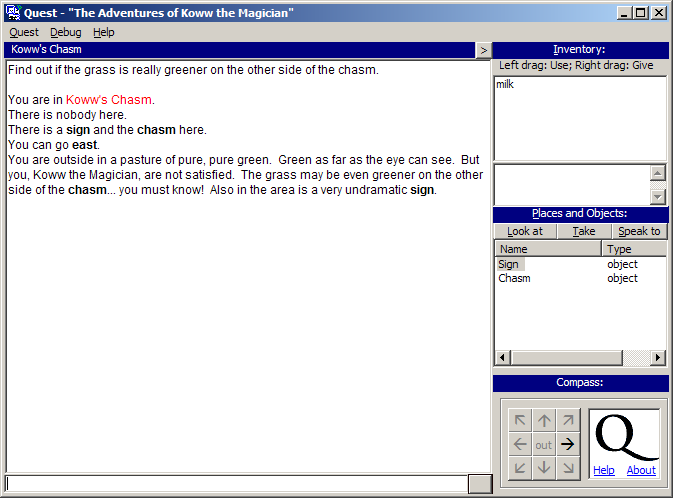 In creating an interactive text adventure, students are now thinking about why these actions occurred in the first place – and deciding how to bring that thought process to life for the game player. Not only can this activity get students to read more closely, but more actively; and that’s the key to developing an essay which has a strong argument, not just plot summary. Plus, once they’ve created their games, they can be easily shared and made accessible as teaching modules for future classes. In the coming months, I’m planning on offering some tutorial courses for my fellow teachers at UCLA (and hopefully finding some funding which will allow me to create an online teaching module to address a wider audience), to decrease the sense of intimidation that the older generation especially commonly feels when confronting unfamiliar technology. 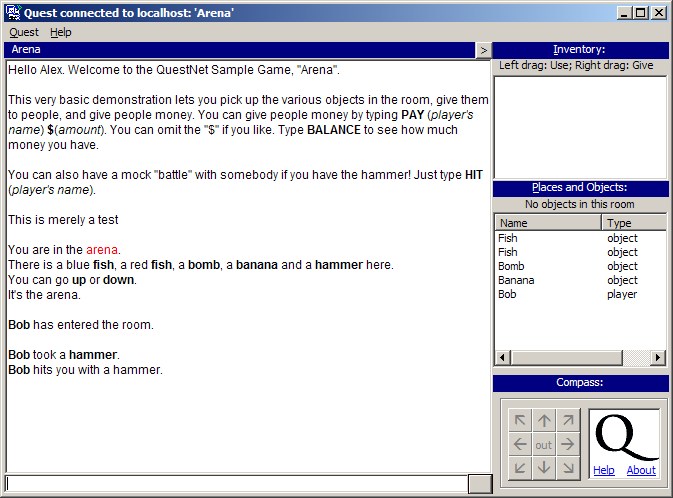 Quest is incredibly easy to use, and yet it’s versatile and sophisticated enough to let you do almost anything you can think of: author complex and customizable characters with diverse qualities, skills, and abilities; map out massive worlds that players can explore at will; add images, links, and even user-driven content. 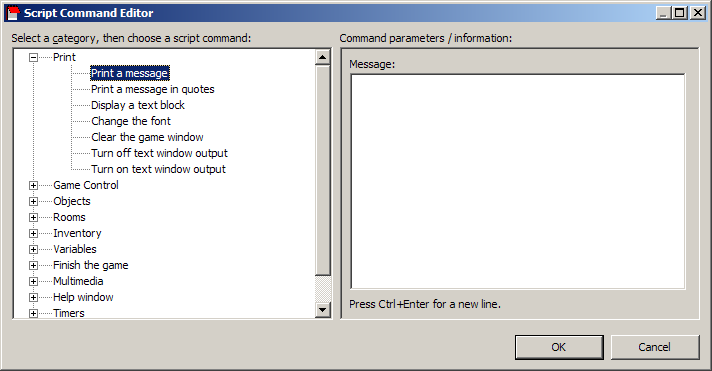 I’ve had absolutely no formal training in computer programming or game design (in the computer science course I ultimately dropped as an undergraduate, I got as far as creating a “Hello World” program before losing interest). Which is part of why Quest is so exciting: it has the potential to bridge the interdisciplinary chasm that currently exists between the humanities and other fields. It can bring the study of literature, history, and many other fields to the cutting-edge and give us humanists yet another strategy for articulating the relevance of our fields, allowing us to defend the university as a whole from the growing budget cuts that threaten to impoverish higher education for teachers and students alike. This is part of what burgeoning digital humanities initiatives like 4Humanities are all about; and I’m immensely grateful that Quest has allowed me to be a part of that movement. Tara Fickle is a Ph.D. candidate in the English Department the University of California, Los Angeles (UCLA), specializing in 20th century American and ethnic fiction. She has recently completed her dissertation, Serious Play: Race, Game, Asian American Literature, and has published articles on Asian American cultural politics, contemporary literature, and game studies in various scholarly and popular journals. More information can be found at her academic website: http://www.ficklet.wordpress.com. This entry was posted in Education, Quest on November 11, 2013 by textadventurescouk.